If you don't already know what Pokemon is, you're probably one of those otaku who has shielded themselves from all signs of Western civilization in favor of spending their days locked in a dark room basking in the glow of a cathode ray tube wondering what it would be like to have a torrid affair with a Sailor Scout. So I'll forego the introductory ground that has already been plowed into oblivion by the likes of Newsweek, Time, and countless other mainstream publications. Of course most parents will fall asleep and most youth will love it to the point of tears. However, what about those of us somewhere in between... Those who can watch Card Captor Sakura and Dragonball Z without feeling a little too grown up for the subject matter? Well, it's not GOOD, but it's not bad either. 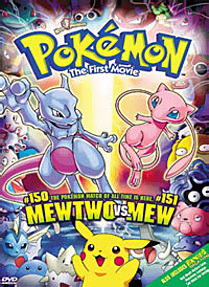 The first 25 minutes of the American version is the real first Pokemon movie, originally titled "Pikachu's Summer Vacation". (For the American version, "Summer" has been dropped.) This isn't the movie the ads have really been pushing. It's more of a side show. Too bad it's totally incoherent, pointless, and fluffy to the point that even the Pokemon crazed kids in the audience were getting restless. Ash, Brock, and Misty drop off their Pokemon for a vacation at a Pokemon resort, in which certain Pokemon react badly towards others, and they generally act cute and funny. Okay, two or three minutes of this here and there are fine, but for 25 minutes?? Sensing the monotony, director Kunihiko Yuyama tries to break it up with some eyecatches involving a particular type of Pokemon. Unfortunately, the noises some of these things make are absolutely freaky! I was surprised none of the kids in the audience broke out crying. *I* would have at that age. Worse, there are so many Pokemon to keep track of and the telling is so incompetant that it is simply impossible to keep straight. Mewtwo Strikes Back at least offers a plot: In typical Jurassic Park fashion, a group of scientists have successfully brought back an extinct Pokemon (Mew) by engineering it from DNA. However, not willing to leave well enough alone, they also made it super-intelligent and ultra-strong. Angered at being merely a test subject, Mew-two (creative!) breaks out and engineers his own ultra-powerful Pokemon... And when Ash and company are invited to a tournament, they try to stop him from taking over the world. Of course, then they learn that fighting is wrong... ^_^; Even the bad-guy-wannabe Meowth waxes philosophical in a scene that inspired everyone over 12 in the audience to vomit uncontrollably. In this, Mewtwo Strikes Back is somewhat contradictory. The antiviolent message that is pretty much crammed down our throats works directly against the entire point of the franchize, which is frankly, controlled animated cockfighting with cute make-believe animals. Mewtwo himself offers some interesting contradictions: He writes off all "trained" Pokemon as being subserviant to humans, but then insults Ash for not being able to train his Pokemon well. Huh? After seeing theatrical trailers, I was expecting the animation to be among the worst I'd ever seen, but although it was slightly inconsistant, it was a lot better than I was expecting. The animation and clean-up is very well done. No "animation experts" who've been nursed and weaned on Disney will find too much fault here. The dubbing, although in standard Saturday Morning fashion, is good and professional sounding, like TAJ Productions is capable of when under good supervision (as opposed to Slayers and other such incidents). Rachel Lills (Utena) is absolutely wonderful as Pikachu, adding a lot of emotion to the character who looks rather balloon-like in the anime version. The ADR direction by Michael Haigney is first rate, as is the entire voice cast, with the exception of the assistant fairy guard (who has a name, although I didn't catch it). Overall, if you can stand the slightly cliche plotline, the overwhelming preachiness, the slow pacing, and the entire first 25 minutes, Pokemon - The First Movie is an interesting field trip for any American fan who's never seen traditional anime movie production values in a theater. This isn't Princess Mononoke, but it should give you a good grasp of what, say, the Slayers movie originally looked like. + Decent animation. Interesting gauge of other anime. − Unbearably preachy. "Pikachu's Vacation" is unwatchable.